What’s goin on guys, Jerry Neutron here back with a brand new video and today we’re gonna take a look at some CPU coolers from a company by the name of Reeven. If you guys haven’t heard of them before they are owned by Scythe Group so the same parent company that makes the Scythe Mugen and Scythe Ninja coolers if you guys are familiar with those but the #Reeven brand focuses more on high-end products instead of mid-range ones and that’s kinda the difference between the two. But anyway they sent me two coolers, this larger single tower cooler with a 140mm fan called the Ouranos and another single tower cooler but with a 120mm fan named the Hans. This one might possibly be a Hyper 212 EVO killer but we’ll have to wait and see once I get it installed! First things first, both coolers work with all modern Intel and AMD sockets so LGA 1151, 1150, 1155, 2011, AM3+ and FM2+. So if you’ve built a system within the last 5 years chances are you’re probably covered. 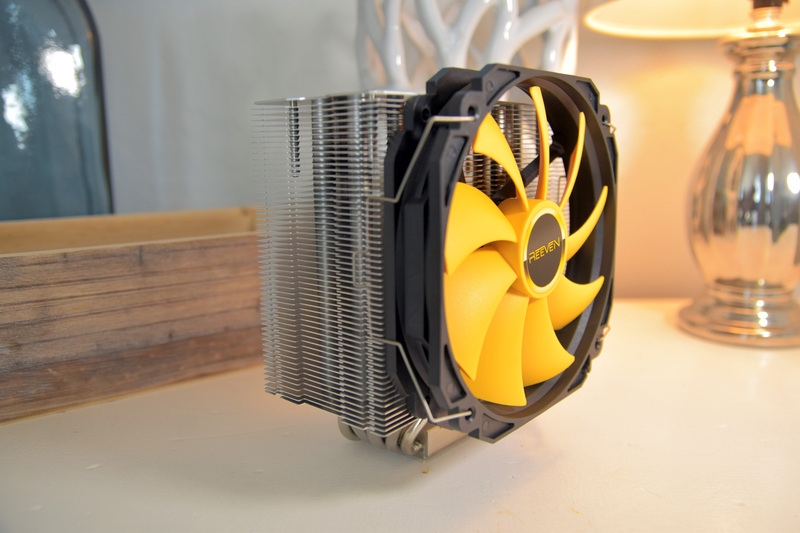 Taking a look at the Hans cooler you can see that it comes with a single 120mm black & yellow fan. Not my favorite color combination but it doesn’t look bad either, you just have to coordinate with the rest of your build. The fan is held on by these wire clips on each side. I personally like the plastic brackets from the Hyper 212 EVO a little bit better but these may give you slightly more freedom when it comes to your fan mounting. Aside from that there’s an aluminum top plate with Reeven branding, a braided cable for the PWM fan wiring, 4 nickle-plated 6mm heat pipes and a polished copper base. On the Ouranos cooler you get a 140mm fan with Reeven branding on the outer edges. A similar aluminum top plate which gives the cooler a premium look, a braided cable, an optional low-noise adapter, 6 nickle-plated heatpipes – two which are 8mm, the rest are 6mm and a polished copper base. You’ll also notice the heat pipes and base are slightly offset and that’s to allow for additional RAM clearance on the fan side which I think is a nice touch. Personally this is my preferred type of cooler, I like the slightly larger 140mm fan to keep noise low and the slightly larger tower, if it’ll fit inside your case should allow for slightly better cooling. And lastly, both coolers include all the hardware needed for installation, including thermal paste but for some reason they package it in a small plastic bag instead of a tube which I’m actually not a fan of because it makes re-using the paste more messy. But that’s about it as far as the coolers go physically so let’s so ahead and get these installed and see how they perform. Of course we’ll be comparing these to the Hyper 212 EVO being that it’s the most popular cooler and it should give you guys a pretty good idea of how these perform in comparison to the cooler that you’re probably running while watching this video. So first up is the Hans cooler, installation wasn’t too bad here. You essentially install the backplate, install the two brackets on the front side of the motherboard, thermal paste and then the fan. Unlike the Hyper 212 EVO, the Hans cooler does not block any of the RAM slots so you have no restrictions on RAM height which is nice. It’s also a slightly shorter cooler at 155mm tall compared to 159 so most cases should be able to accommodate for it’s size. As for noise, here’s how the cooler sounds at idle and full speed. Now moving on to the Ouranos, installation was actually the same for both coolers. Neither one had screws that were hard to reach so I was able to install both without removing the motherboard from my case. 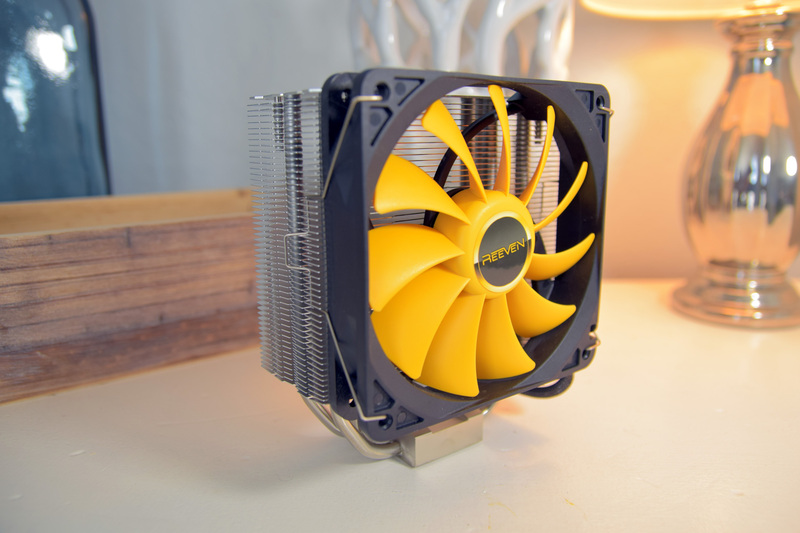 This cooler is a little bit taller at 161mm so make sure you have proper clearance to install it in your rig. Unfortunately it does not fit in the Pandora ATX so we’ll be testing all of these coolers with the side panel off. However given the size of the Ouranos, I was impressed with the amount of RAM clearance you get. Like the Hans cooler you have very little restriction in regards to your RAM choice. As for acoustics, here’s the Ouranos at idle and full speed. Alright so with all of that other stuff out of the way, we can finally get down to how these two coolers perform. My test system is running an i7-4790K at 4.5GHz on 1.25 volts. Ambient temp is 27* C and once again all coolers are being tested with the side panel off and full fan speed. So as you can see the Ouranos performed the best overall, beating out the other 3 coolers including my Dark Rock TF which I normally run in this system. It’s not a tower cooler itself but I wanted to see how it would fare in comparison to the two Reeven coolers. 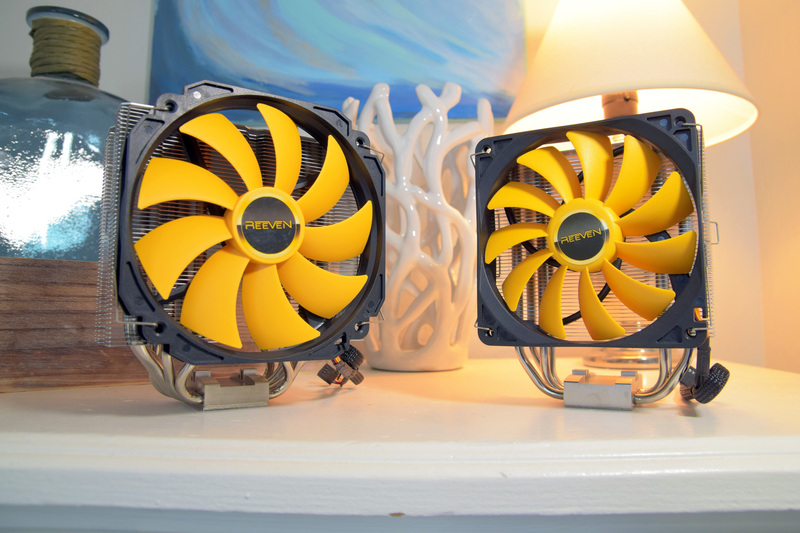 The Hans cooler only slightly outperformed the Hyper 212 EVO but did so at a much lower fan RPM meaning the system performed similarly while being noticeably quieter which is a plus. In terms of noise, the Hyper 212 EVO was the loudest, followed by the Hans cooler, then the Ouranos with the Dark Rock TF being the quietest. Also before I forget to mention it, build quality was solid on both Reeven coolers. Not quite to the level of Noctua or be quiet! but more than adequate so no complaints from me there. So that’s about it guys, the Hans cooler looks like a worthy Hyper 212 EVO alternative, assuming the pricing is competitive and the Ouranos offers even better cooling for less than $50 bucks. Now all they have to do is convince people to install a big yellow fan in their system. Let me know what you guys think about these coolers down below! Comment mellow yellow if you made it this far, don’t forget to like this video if you enjoyed this type of content, subscribe if you haven’t already and until next time…see ya!